Was Noah’s Flood Worldwide or Local? Steve, I’m married to someone who believes that the contents of the Bible are the infallible Word of God. He therefore claims that the entire globe was flooded during Noah’s flood. This makes no sense to me. What do you think? I, too, believe the Bible is the infallible Word of God. You just have to read it in proper context in order to properly understand it. Context is everything when studying God’s Word. That’s why I’ve posted so many Bible studies to the Have Ye Not Read? website, which is designed to help people understand some of the more controversial Bible topics. The original manuscripts from which the book of Genesis was translated do not say the entire earth was flooded. By context, they say that the land the descendants of Adam and Eve lived in was flooded. Not the entire globe. But the entire geographic region the Adamites lived in. The idea that the entire globe was flooded during Noah’s flood comes about largely because of the mistranslation of one of the Hebrew words for “earth” (i.e., erets) as well as the phrase “the whole earth” in Genesis chapters 7 and 8. Any reasonable person reading that verse without giving it much thought would agree that the “whole earth,” meaning the globe, had been flooded. However, the word translated “earth” in this passage is the Hebrew word erets (i.e., Strong’s Concordance #H-776). That word indeed means “earth,” but in many variations. For example, it can mean the entire globe, but it can also mean a specific chunk of ground, a specific area of land, a specific country or nation, or even simply a field. From an unused root probably meaning to be firm; the earth (at large, or partitively, a land): – X common, country, earth, field, ground, land, X nations, way, + wilderness, world. In other words, it can refer to any individual part of the earth. It can even mean a field, or just a specific chunk of ground (for example, see Ezekiel 29:5 where erets is translated “the field”). So because of its multiple and nuanced meanings, the Hebrew word erets has to be translated according to the context of the surrounding verses in which it occurs. And there are two vital points of context in the Bible account of Noah’s flood that I’d like to point out as I make my case that the flood of Noah was definitely not worldwide. Putting two of every animal on the face of the earth into Noah’s Ark would have been a physical and logistical impossibility. After all, modern science tells us that there are 7.77 million species of animals, of which 953,434 have been described and cataloged. Let’s forget about the 7.7 million species, and just stick with the scientifically cataloged 953,434 species. Two of each of those animals would equal 1,906,868 animals on a single boat. That’s one million, nine hundred and six thousand, eight hundreds and sixty eight animals, all being cared for by eight people! And don’t forget that God told Noah to take more than two of certain animals. For example, He told Noah to take seven each of all clean animals, meaning all animals that can be used for food and sacrifice (Genesis 7:2). Plus the “fowls of the air” were to be taken in groups of seven each (Genesis 7:3). So, in reality, there would have had to have been multiple millions of animals on that ark, if the entire globe had actually been flooded. The bottom line is that there’s never been a boat big enough to hold two of every animal on the face of the earth. Not in the entirety of human history has there been such a boat. Noah’s Ark, for example, was approximately 450 x 75 x 45 feet in size, while the Titanic was 850 x 92 x 64 feet in size. Even the Titanic couldn’t have held a tiny fraction of the animal species existing on the entire earth. This is why, for centuries, scientists have ridiculed the story of Noah’s flood. They know it would be physically impossible to put two of every animal species in the world (plus seven of some species) — along with enough food and water to feed them for months on end– onto a single boat, particularly one with the stated dimensions of Noah’s Ark (Genesis 6:15). So the context in which the word erets is used in the Biblical account of Noah’s flood cannot possibly be a worldwide context. Instead, by simple logic and common sense, it had to be a far more localized flood, meaning a flood of the Mesopotamian Valley the descendants of Adam and Eve lived in. Adam and Eve’s descendants, at that time, lived in the Mesopotamian Valley, between the Tigris and Euphrates rivers — an area also known as the “Fertile Crescent” because of the abundant crops that could be grown there. And putting onto the ark two of every local animal species living in that valley would have been quite possible, indeed. The flood of Noah was designed by God to drown the progeny of the fallen angels who had mated with the daughters of Adam and Eve in Genesis 6:1–5, creating a hybrid race of very wicked individuals who were also gigantic in size compared to normal humans. As you’ll see in the verses below, that act of mixing with the fallen angels, over time, had corrupted the entire Adamic bloodline except for Noah’s family. From H119; soil (from its general redness): – country, earth, ground, husband [-man] (-ry), land. When the fallen angels came to this earth, as described in great detail in the Book of Enoch, they purposely targeted the descendants of Adam and Eve, knowing that the Messiah would ultimately be born through that specific bloodline. Why did they target the descendants of Adam and Eve? Their goal was to genetically taint that chosen Adamic bloodline so the Messiah could not be born through it. They were trying to circumvent God’s great Plan for salvation through His long-promised Messiah. One of them is the Hebrew word erets (verses 4, 5 and 6) which we’ve already looked at, and which should have been translated “land.” And the other one is the Hebrew word adamah (in verse 7) which we’ve also already looked at, and which should have been translated “soil” or “ground” as it is in Genesis 2:7. Nowhere in these verses is the entire globe being referred to. As you can see from verses 4-7 above, the fallen angels created a real mess. With the exception of Noah and his family, all Adamic flesh had corrupted their bloodline by mating with the fallen angels. They had all become genetic hybrids. In other words, by context it was not the entire world, but only that narrow section of the world in which the ungodly act of mating with fallen angels was taking place. Keep in mind that the Adamic race is the genetic bloodline through which Christ Jesus was to come, and He had to be perfect in His lineage or He could not be the saving Messiah of God. Biblically speaking, He couldn’t come from a mixed or hybrid lineage. He had to be purely Adamic, and not of any other race. Why Did Noah Find Grace? The first use of the word “generations” in the verse above is translated from the Hebrew word toledah (i.e., Strong’s H-8435), meaning “family descent.” So we can see that the subject matter is Noah’s family genealogy. In the original Hebrew, the phrase “perfect in his generations” means “without blemish in his posterity” or “undefiled in his posterity” (see Strong’s H-8549 and H-1755) Noah’s bloodline (genealogy) was undefiled, meaning neither he nor his family had wickedly mixed with the fallen angels. In other words, Noah and his family were the last Adamic people alive in that great Mesopotamian Valley with an unblemished bloodline. They were pure bloodline Adamites, while all others had, over time, mixed with the fallen angels hoping to become “as gods,” precisely as Satan the serpent had promised Eve in Genesis 3:5. Thus, with the exception of Noah and his family, Adam’s descendants had become genetic hybrids. Finally, in Genesis 6:9 above we see the phrase “Noah walked with God,” which is a Hebrew euphemism meaning Noah ordered his steps, or his way of life, in accord with God’s way. Yes, Noah understood that the Messiah would eventually come through the bloodline of Adam and Eve, and would have to be genetically perfect. So while all of the other Adamites were mixing with the fallen angels, Noah made sure himself and his family were of perfect pedigree, meaning of an unblemished bloodline. In other words, Noah and his three sons and their wives were the only family left in that great Mesopotamian Valley that had not wickedly mixed with the fallen angels or with their “giant” progeny. Noah and his family stuck with God and followed His Word and His ways. This is why Noah is referred to as “a preacher (or, herald) of righteousness” in II Peter 2:5. So God flooded that Mesopotamian Valley in which the hybrid progeny of the fallen angels lived. He wiped out every descendant of Adam and Eve that had wickedly intermixed with the fallen angels, which was everyone but Noah and his family. But first He ordered Noah to build a large ark and round up two of every local specie of animal and place them on the ark. Why? So this very same geographical area could be repopulated with its own native species after the flood was over. Noah, his wife, his three sons and their wives (i.e., only eight people in total; I Peter 3:20) were saved, in order to repopulate that specific area of the earth that had been flooded. And the male and female pairs of animals they took on the ark were saved for the same purpose. In other words, God used the flood to wipe out the gigantic half-Adamic/half-angelic hybrids living in that great Mesopotamian Valley. 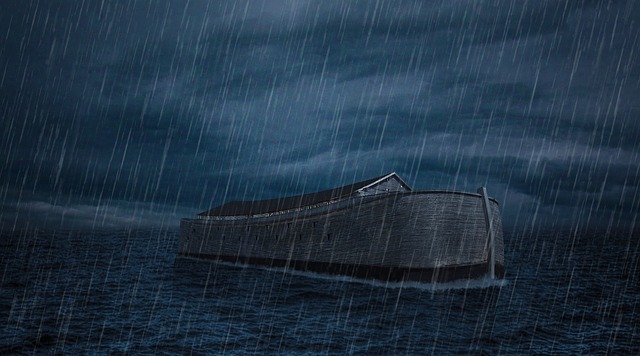 And He then used Noah and his family to repopulate that same area after the flood. It’s that simple. So when you take the account of Noah’s flood in its proper context, you can see that the phrase “whole earth” in Genesis 8:9, which we looked at earlier, should have been translated “whole land,” or perhaps “whole country” or “whole area.” The flood was definitely not global. Exo 10:14 And the locusts went up over all the land of Egypt, and rested in all the coasts of Egypt: very grievous were they; before them there were no such locusts as they, neither after them shall be such. Exo 10:15 For they covered the face of the whole earth, so that the land was darkened; and they did eat every herb of the land, and all the fruit of the trees which the hail had left: and there remained not any green thing in the trees, or in the herbs of the field, through all the land of Egypt. But by taking verse 15 in proper context with verse 14 before it, it becomes abundantly clear that the Scriptural passage is talking about the entire land of Egypt, and not the entire globe. So once again, the phrase “the whole earth” in verse 15 should have been translated “the whole land” or “the whole country” or “the whole area.” How the translators missed that, I’ll never understand. But it’s as clear as a bell for anyone willing to look at the very clear context from verse 14, and give it some thought. In Jeremiah’s time, Babylon did not cover the “whole earth.” Nor has it ever. Indeed, it was located in that same Mesopotamian Valley in which Noah’s flood had taken place centuries earlier. So by context, the phrase “the whole earth” is referring solely to that geographic area of land upon which the nation of Babylon was situated. So again, context is everything when translating the Hebrew word erets. And in many cases the Biblical translators did a very poor job of utilizing the context when they translated the word. In areas where it should have been translated “whole land” or “whole country” or “whole area” it was incorrectly translated “whole earth,” wrongly implying the entire earth, or the globe. As you can see, the context of both of those verses is global, because God is, indeed, the God of the entire globe. After all, He created it in Genesis 1:1. So once again, context is everything when translating that Hebrew word erets. It can mean the entire earth, or it can mean a very specific area of land located somewhere on the earth, as it does in the Genesis account of Noah’s flood. The bottom line is that God used the flood of Noah to wipe out those wicked hybrid “giants” that had corrupted the entire Adamic bloodline with the exception of Noah and his family. Yes, God saved Noah and His family so the Messiah could eventually come through their progeny with an unblemished bloodline. But He drowned the hybrids in the flood. So the “whole earth” was not flooded. For example, the Chinese are still with us, today. The blacks of Africa are still with us. Many other races that lived in different parts of the world at that time are still with us.